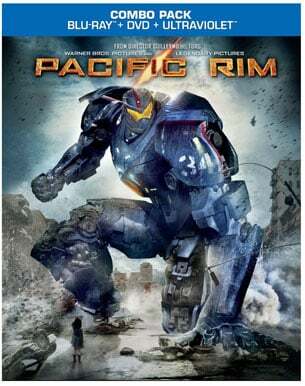 If you enjoy giant monsters and giant robots, well you’re luck because Pacific Rim has both of those things! While the movie has it’s enjoyable moments, I still thought it could have been better. Pacific Rim is about our world connecting with another world where big monsters (kaiju) go through a portal, and up into our ocean and wreck havoc on us all. All the world’s governments have put their petty squabbling to rest and joined forces to come up with a way to battle them. They come up with jaegers, giant robots that are teamed with 2 human pilots inside. The pilots have to work well together & have a unique bond so they are usually related. 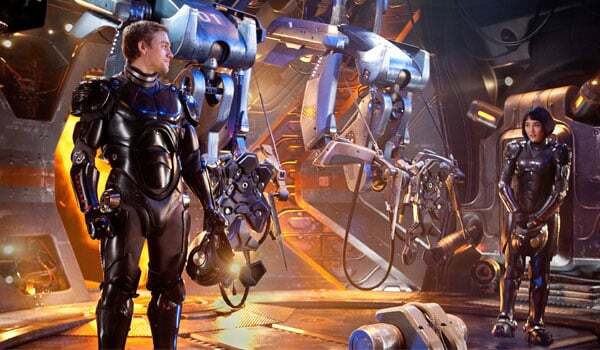 After losing his brother from a previous battle with a kaiju, Raleigh (Charlie Hunnam) is brought back into the battling robots game since the world is supposedly ending and everything. I heard mixed things going into this movie so I wasn’t sure if I would like this or not. I originally didn’t think much of this when I saw the trailer. Just looked kind of dumb to me, After watching Pacific Rim, it’s entertaining for the action scenes but boring the rest of the time. The look of the movie is great, seeing giant robots fighting monsters is cool and fun to watch. I could care less about the characters and all the bogged down storyline though. I know everybody wants character development and all that stuff but I just didn’t care for anyone in this movie. When someone died or got into a fight, I just didn’t give a crap. The movie also has typical movie cliches like family member dying and then that other person walks away from it all type of thing. Then they have to bring him back into things because he was one of the best, yadda yadda yadda. Another instance is a pilot who doesn’t like one pilot but the pilot is saved by that pilot and then he likes that pilot. I’m exhausted just typing that. I’m not sure what I would do differently about Pacific Rim to make me like it more. Not to fault the actors, but some of them should have been cast for more well-known people. I liked Idris Elba and his character, and I like the work from Max Martini since I’m a big fan of The Unit. I just think Charlie Hunnam was an eh kind of casting decision for the lead role. I felt the lead required a little bit more star power to be honest. I also wasn’t a fan of Charlie Day in this movie and I usually like him in the movies I’ve seen him in. I just felt that whole storyline was stupid and annoying. So basically, the only thing I really liked about this movie was the special effects and fight scenes. The Blu-Ray special features are contain on a separate discs, which kind of tells you that there is a lot. There’s 14 featurettes about the special effects of the movie and they each go into different areas of the movie. I love seeing behind the scenes of movies, particular the special effects stuff. Of course John Knoll and ILM were apart of this movie, if you couldn’t tell how awesome the special effects were. Another feature I enjoyed was the blooper reels. Sometimes you don’t get that for these types of movies so that was a nice surprise. There were some deleted scenes, galleries and stuff like that was well. Pacific Rim is the type of movie that you just turn off your brain and watch a bunch of giant robots fight giant monsters. All of the rest of the stuff is fodder to that. I think fans of Godzilla and anime will like this movie more than the casual movie-goer.